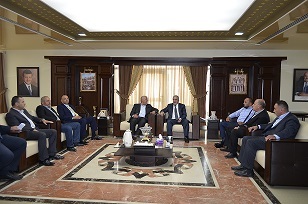 The AAU President, Prof. Sari Hamdan received in his office on Thursday 13/9/2018 a delegation from Al-Salt Sport Club. During this reception, AAU allocated nine scholarships, five of which were discounted 40% for the specialization of Physical & Health Education. The remaining four scholarships were discounted at a rate of 35% valid in all other AAU specializations. These scholarships aimed to support Al-Balqa Sport Club in particular and the clubs of the Kingdom in general.